Hi everyone. 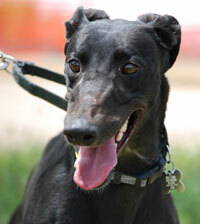 I’m Winnie, a medium size black female, very friendly, active and affectionate. I like to know what’s going on and will trot along beside you as you move through your day. I know I will love toys and I dream of my own doggie beds – one in every room ‘cos I like to be where you are so that I get oodles of petting. I’m definitely not into cats, but I like being around other dogs and enjoy people. I can’t wait to run at a safe doggie park or go on long early morning walks when it’s cool with my special someone. While I’m no interior decorator, I know that the color black goes with just about everything, so I will complement your color scheme in every room of your home. My cell phone is charged, just waiting for you to call me, and take me home.